LuxuriaMusic Record Bag. It’s not paper. It’s not plastic. It’s the new, 100% natural cotton LuxuriaMusic Record Bag, and it’s available now. What better way to show your love for your favorite radio station than with this handy, lightweight tote? It’s tall and wide enough to hold vinyl LP’s, and its long, 28-inch soft handles make it easy for carrying. And Kevin Kidney’s cool Luxuria Music logo identifies you as a listener of impeccable taste. The price? Just twenty dollars for one, or two for thirty. Your purchase will help to keep LuxuriaMusic.com going — and bringing you even more great music and programs in the year ahead. It’s in the bag. 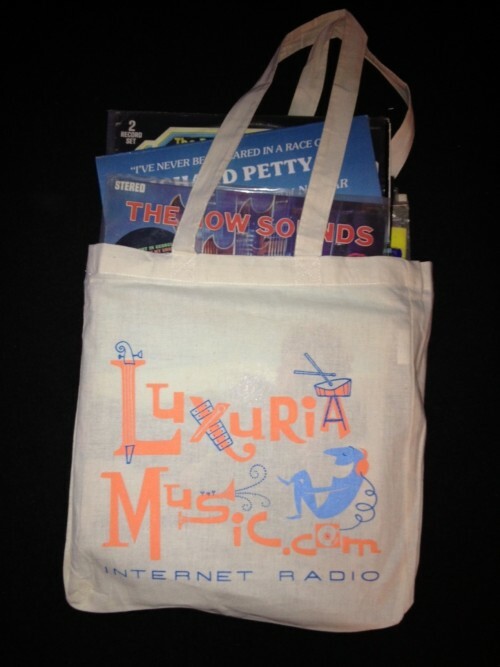 The LuxuriaMusic Record Bag.